Hi, I'm Ashley & I'm a blogaholic. Here are my top four fashion blogs that I am reading right now! I hope you all check out these fantastic fashion blogs. Let me know of any blogs you think I should check out! I discovered her show Courtney Loves Dallas. I have only recently discovered Blaire Eadie (through searching #fashionblogger on intagram of course) and I am obssesed with her style. I love that she re-wears & restyles outfits throughout her blog. Appealing to the average girl like me that can't afford to wear an outfit only once. I think Richelle & I channeled each other when designing our blogs (before we knew each other existed). 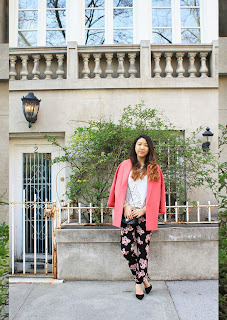 Love her blog & the fact that her style is so different in every blog post. First of all, how cool is it that Kelly lives in NY?! Jealous much? Her style is super girly with a slight edge and she totally rocks every outfit! Her blogs looks great & she does all the designing herself!